The Indian Army moved swiftly to the aid of the people of Chirang District amidst a heavy deluge and pouring waters of overflowing rivers. Based on a call for help from the local people, the Army launched four teams on 22 Jul 16 in the Khungring area of Chirang District in Assam. 30 people who were helplessly trapped in their marooned village were rescued amidst fast currents and taken to relief camps. The Army deployed its boats to reach the marooned people and made a number of trips against the swift current to save the people. 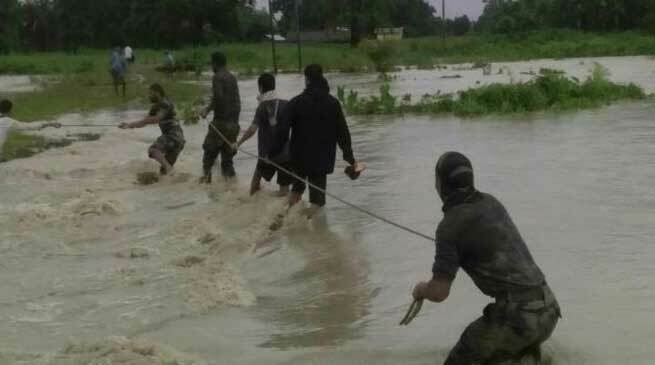 The Army is dedicated towards the safety of the people and despite all odds is standing by to save people amidst concerns of rising water level in Assam. The Army Flood Control Centre at Tezpur is functioning round the clock to monitor the flood situation and coordinate relief and rescue efforts where ever required. All units under the Area of Responsibility of the Gajraj Corps are fully alert and geared up to react swiftly to any flood related contingency.